We will bring you professional, affordable and quality managed legal services. You are at the center of Allaw® Managed Legal Service philosophy, operations or ideas. At Allaw we believe that our clients are the only reason that we exist and use every means at our disposal to keep the client happy and satisfied. We provide Managed document review services, Contract Lifecycle Management services, Contract Compliance services, Regulatory Risk & Compliance Services, Data Protection & GDPR and many more solutions for businesses. You can choose your managed legal services plan below or contact us for your individual plan! Our experts are available 8 hours a day, 5 days a week by customer desk & by phone for those times when you need help. Whether you need help with document review, contract or corporate document drafting we are here to assist you! Choose your managed legal services plan to get started ! How Managed Legal Services Pricing works? 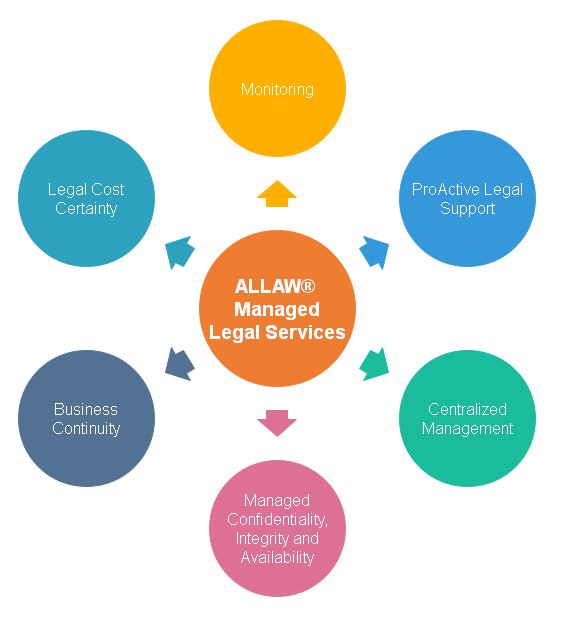 What are Managed Legal Services by Allaw? Below we dive into what Managed Legal Services actually are, along with their advantages and disadvantages, so you can make the best decision for your business.